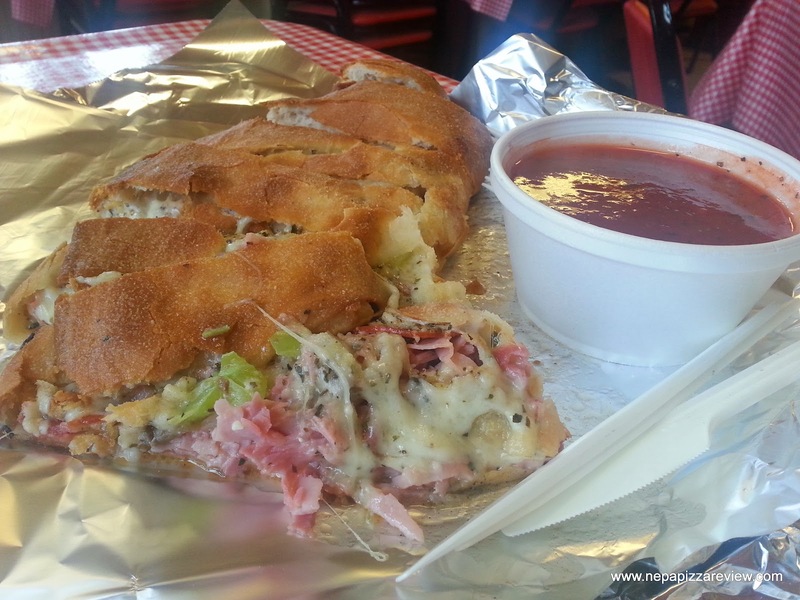 I first found out about Joe's Pizza in Nanticoke when he was generous enough to respond to my open request on social media to pizzeria owners to donate 100 free slices of pizza to NEPA BlogCon 2013, which is a local blogger and social media conference. Joe stepped up to the plate and came through with 100 slices for the BlogCon attendees who enjoyed their cuts. Coincidentally, if BlogCon 2014 is in the planning stages, so if any pizzeria owners want to join in this year, please get in touch and I can point you in the right direction. It's a great conference and proceeds do go to charity as you can see on the website. Anyway, Joe's Pizza is one of the most active NEPA pizzerias on facebook, and his webmaster has made Joe an online celebrity of sorts, so I follow along with his antics and watch what's going on, but I don't get to Nanticoke much so it took me about 6 months to get down and actually review the pizza. The first lady (my girlfriend) heard and read so much about Joe's generosity that she finally made an executive decision and said we are making the trek south to try Joe's Pizza out once and for all. When we arrived, we walked into a simple dining area with about 5 tables, several coolers with various cold adult beverages available for takeout, and of course Joe standing in his kitchen in front of the ovens. The half wall surrounding the pizza making counter allowed us to be greeted and entertained by Joe himself as he went about his business handling all aspects of the operation. When Joe took our order, he recommended that we try the Artigiano pizza, which is essentially the traditional pizza with a little more cheese and sauce but tastes a bit different because it's made "the old way" as Joe described. As a fellow pizza maker, I couldn't agree more, that you can take the same exact ingredients and prepare two pizzas each just a little differently, and both will taste unique from the other pizza. And who were we to pick any other pizza besides the owner's choice?! While Joe was making the pizza, we learned a lot about pizza, life, his business, family, and a whole lot more. Eating at Joe's may not be a formal dining experience, but it's a wholesome, fun, engaging, and neighborly excursion which we very much enjoyed. The dining area's simplicity is filled with Joe's charasmatic and friendly personality and that makes all the difference. When the pizza was done, Joe "the one man show" himself brought it to our table and awaited our reaction. I tried the first slice noting that the pie had a little weight to it because of the extra cheese and slightly dense dough. I took my first bite and there was a very satisfying crunch and texture to the pizza. I very much enjoyed the hearty sauce that wasn't too chunky, but wasn't too smooth either. It had a lot of body to it, was well seasoned, and nicely balanced. I have to consider this to be one of the more unique sauces I have come across. Since the sauce consumed so much of my interest, I unfortunately didn't pay much attention to the cheese so I will have to visit again to determine what Joe's secret cheese is. The crust reminded me of a dense bread, sort of like a sourdough because it had such a nice crunch and great flavor. Overall we very much enjoyed the pizza, especially the first lady. After our evaluation, we gave Joe our honest verbal report of what we thought and he informed us that he had something special for us to try before we left - it was his signature stromboli which apparently is quite popular. 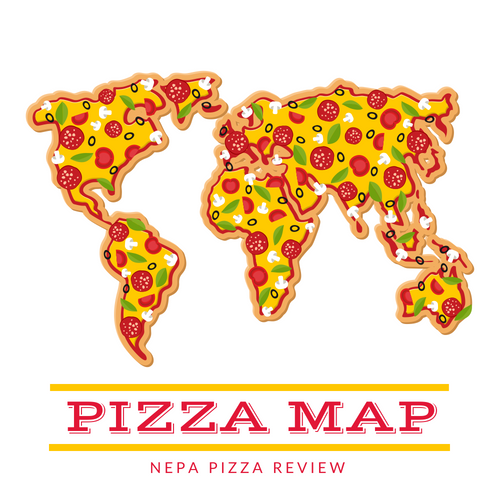 Thank you to Joe's Pizza for their support of NEPA Blog Con, NEPA Pizza Madness (most votes overall, most creative, most active, most entertaining), and for all that they do for the community.